Hibiscus rosa-sinensis and its relatives will astound you! The information here and in our links will satisfy beginners and experts alike who want to grow and display these beauties. Any questions? Email me! NEW!! You can now get a good range of grafted hibiscus varieties (in Eastern Australia) in tubes. You need to grow them on in 127 to 140 mm pots. The saving is in the postage. Visit Bouganvillia Dell Nursery for more details. The rootstocks are albo-lacinatus with the bottom eyes removed. There are over 80 scions grafted in restricted numbers. Be quick to order! Orders taken for quantities. Hibiscus are spread throughout the world in various species. 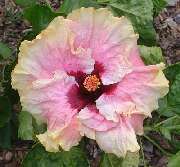 The most famous is Hibiscus rosa-sinensis, the so-called Hawaiian Hibiscus to many. You will be introduced to many aspects of growing hibiscus from propagation by seed, cutting or grafting to growing and maintaining plants in many climates. You will read about hybridizers in many countries and see the huge range of newer blooms as well as enjoy the older varieties. I hope to display 1000 varieties from my garden and supply links to so many more. The various species, especially the native hibiscus from Australia and other places will also be referenced. The art of displaying your blooms and photographing and printing them will be explained. How to win at shows will also be a topic. The various Hibiscus Societies that support the world of hibiscus will be listed and the Hibiscus Mail Lists available on the Internet will also be presented. Hibiscus from around the world get registered and this nomenclature procedure will be explained. 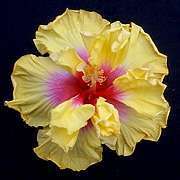 Internet sites supporting hibiscus, whether nursery or private, will be listed for your further enjoyment. Ways of dealing with pests and diseases and how to provide nutrition for excellent blooming will be explained. The tools needed to maintain your plants and propagate them will also be shown. Enjoy your visit here and return often to refresh your experience.